Apollo's backpack was confiscated along with a laptop full of incriminating evidence and fake debit cards. I'm pretty confident in my belief that he's going to be doing some hard time behind bars. However, despite everything that's going on in his personal life, Apollo immediately began tweeting after Sunday's Real Housewives of Atlanta episode. Fans were going IN on his disgusting barbaric convict-like behavior when he tried to windmill Brandon to death. Instead of laying low and playing it cool (and apologizing for his actions), Apollo took the time to reply to a few of the naysayers. Something about this Apollo guy just rubs me the wrong damn way. I remember when he went off on me on Twitter because I posted the wrong link to his shyt-filled workout video. This light-bright peanuts for brains "man" is upset at all the wrong people. He chose his life and now he will have to live with those consequences but there's no reason for him to take his anger out on everyone else. His arrogance is beyond me. If I were facing the charges that are awaiting him on his February 12th trial, man the last thing on my mind would be Super Bowl parties! Imma need for Apollo to take unlimited seats and focus on what's important in life! Go work on your defense, dammit! Go spend time with your sons! Try to mend your broken relationship with your wife! Do sumthin'! 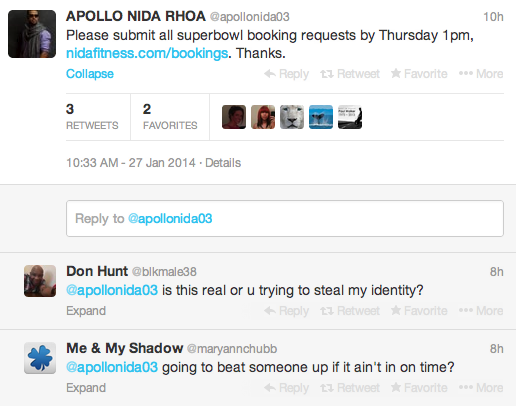 What do you think about Apollo tweeting as if he's not facing 40+ years in the federal pen? Hot mess, just hopes it playing out on RHOA!!! I'm ready to hear Phaedra's lies in an attempt to cover up this whole situation!